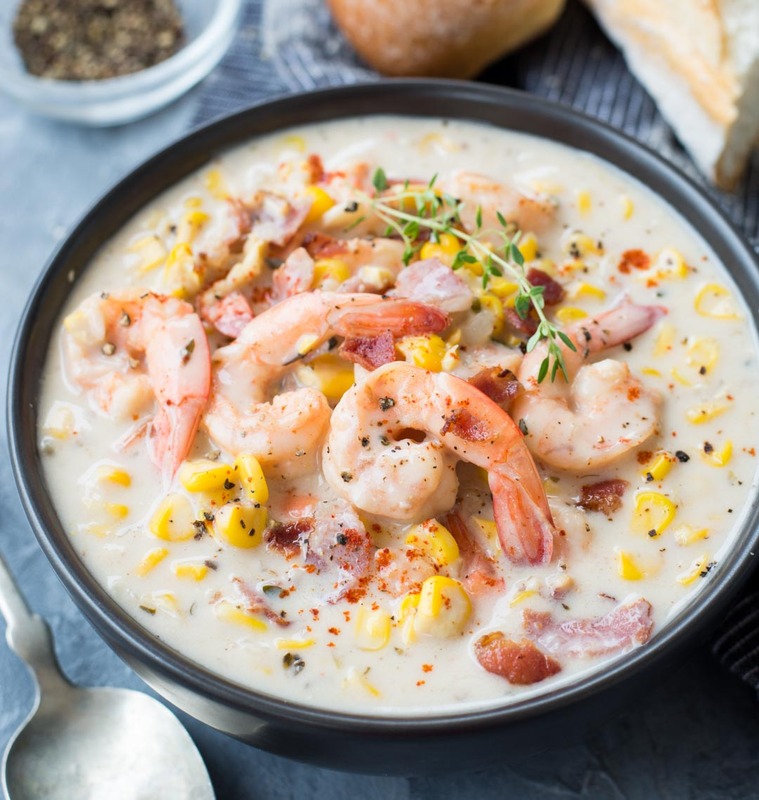 Thick and Creamy Shrimp Corn Chowder with Bacon is a hearty soup to keep you warm and cosy on a cold winter night. It is easy, one pot and takes less than 30 minutes to make. 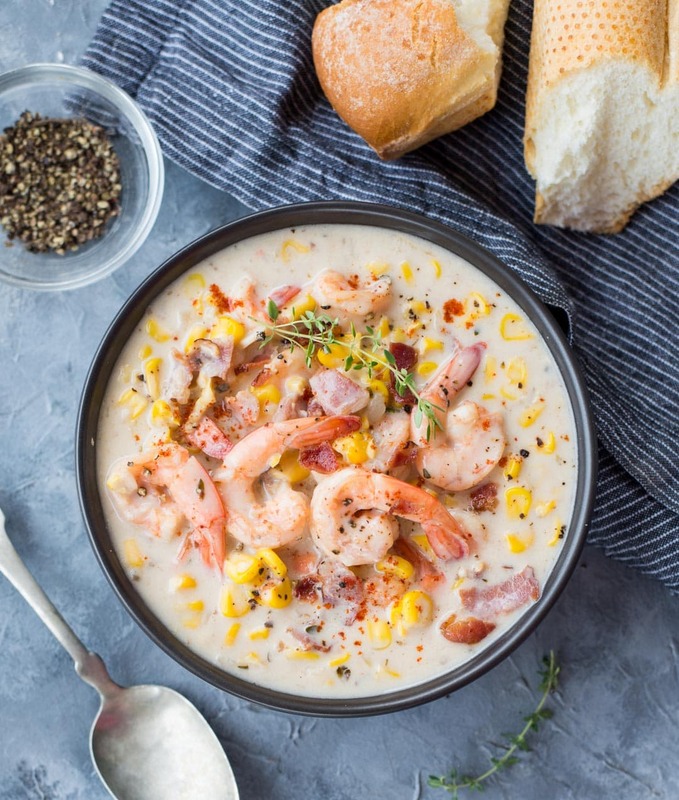 Shrimp and Corn Chowder with Bacon is the kind of soup you would need to cosy up on a chilled winter night. It is creamy and comforting. 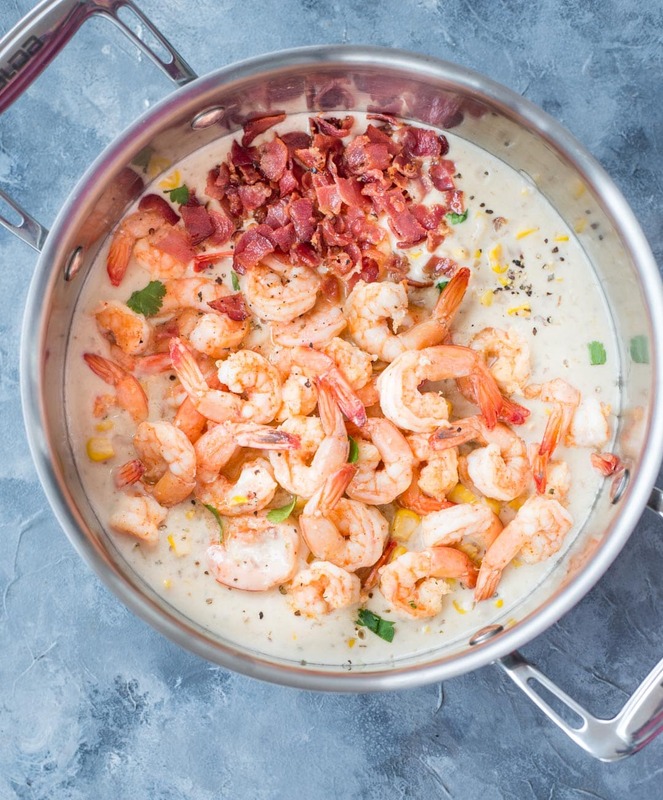 There is shrimp, fresh corn, creamy broth and to make everything better there is bacon. So make a big pot of this creamy deliciousness and settled down on a couch with a bowl full of it. It has been raining here every other day. It is cloudy and gloomy. Glad that I had made a big batch of this Fresh Corn Chowder. We dunked some rustic baguette to the creamy broth. It was really satisfying. My husband declared it as one of the best soups to date. In fact, he happily had this for two days in a row. I am telling this because he is not a fan of corn, be it in any form. Strangely since past few months, his food preferences have been changing. Suddenly he started to like papaya, corn and lots of other stuff he never used to like. 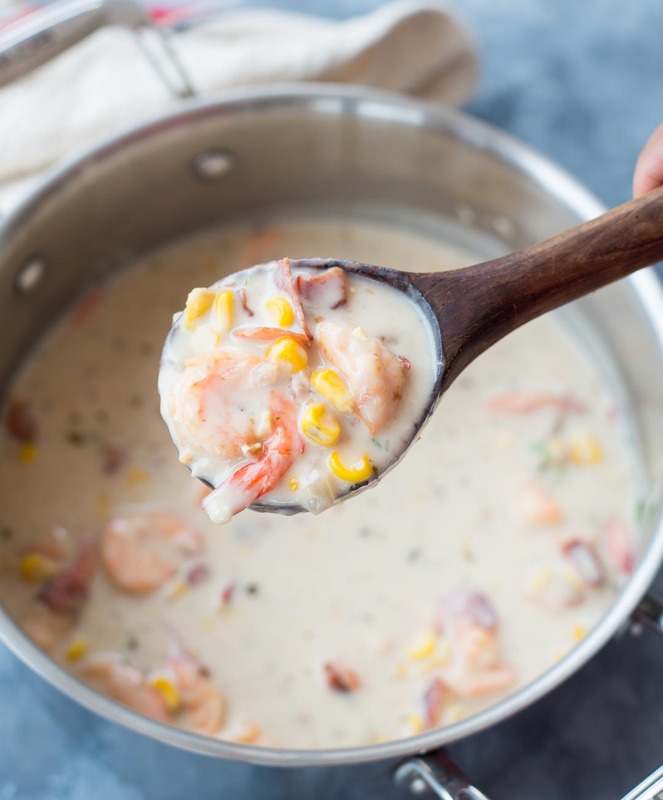 Chowder is a creamy soup made ideally with seafood, Potato, onion, garlic and cream. It is said to be from French Origin. It is thick, creamy and chunky. Though Seafood is commonly used in chowder, you will come across a lot of variation. Corn, Chicken, Bacon even vegetable. Nevertheless, which variation you make, chowder is delicious and extremely satisfying. Along with cream, vegetables like Potato when gets cooked it helps to thicken the chowder. I have not used any potatoes. The cream is enough to thicken the soup. And while adding corn, I pulse some of the corn in a blender. It helps is making the soup, even more, creamier and rich. 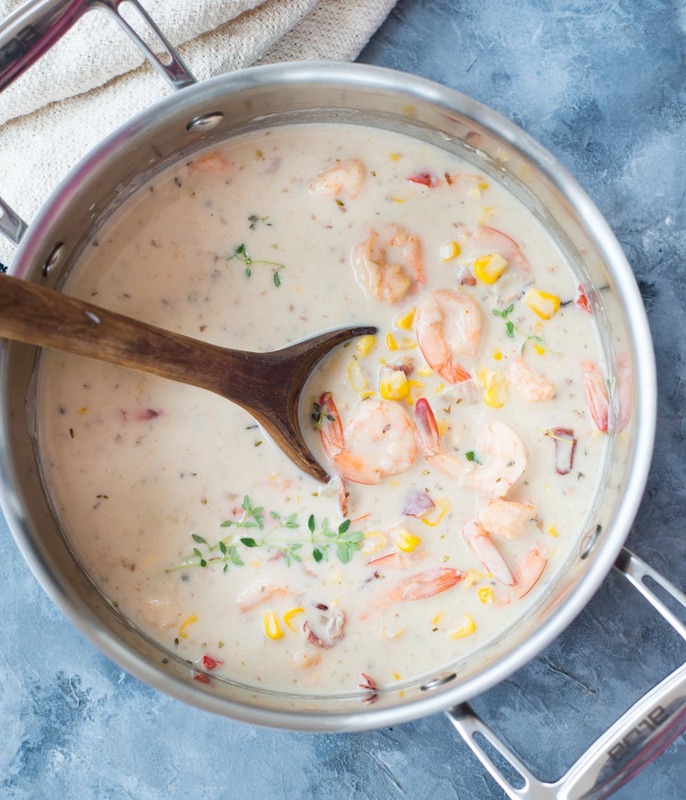 You can use frozen corn and shrimp in this recipe as well. 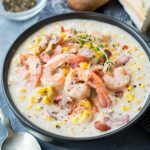 HOW TO MAKE SHRIMP & CORN CHOWDER? Corn Chowder Recipe is pretty simple and easy. You need only one pot and less than 30 minutes to make. Start with preparing the ingredients. Clean corn and devein shrimps. I prefer keeping the tail on because it adds so much more flavour to the broth. 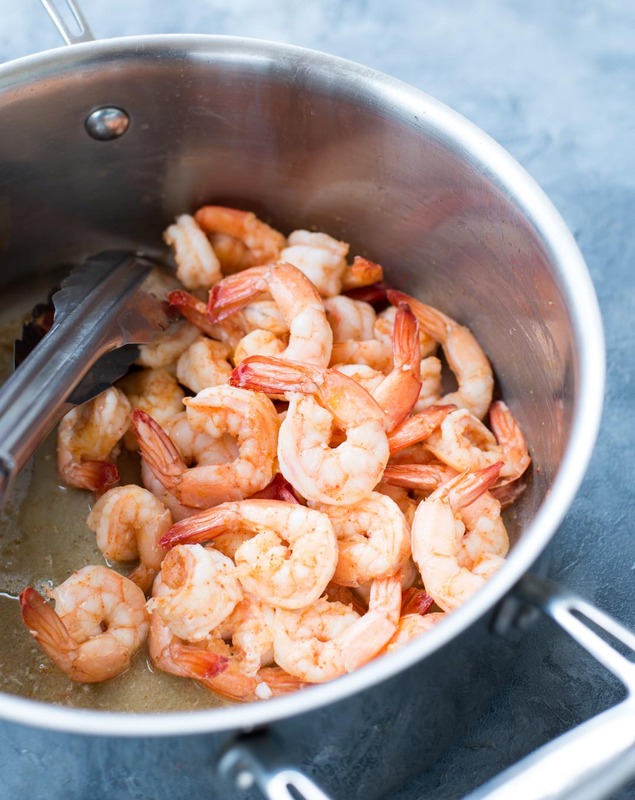 If using frozen shrimps, keep it out on the kitchen counter to thaw. When the prep is done, begin with cooking bacon and make them really brown and crispy. I know it is really tempting to let go of that bacon fat, but the flavour would be overpowering. So remove extra bacon fat from the pan. Next step is to saute the shrimp in butter till it turns pink. Remove from the pan and keep aside. To the same pan, add minced garlic and onion. Cook until it has softened and no more raw smell is there. We are not browning onions too much because it would change the colour of the soup. Then to the pan add corn and herbs. I prefer roughly mincing few corn kernels to release all those sweet creamy juices. This step is optional but it helps to make the soup more creamy. Saute corn in onion garlic mixture for some time to make it aromatic. Add stock to the pan and simmer for 12-15 minutes. Towards the end of the cooking add shrimps. Stir in cream. After adding cream, don’t cook for too long. Stir in the bacon. And it is done. I had made a big batch of this Corn Chowder and it stayed well in the refrigerator for 3 days. I have not really frozen it, so can’t really help with that. You can have as it is or serve with a piece of crusty bread. Have you checked the other soup recipes on the blog? Start with cooking bacon pieces. Let it cook until crispy. Keep aside cooked bacon. Discard any extra fat from the pan and save it for later use. Add Shrimp to the pan and let it cook until it starts to look pink. Remove and keep it aside. To the same pan add butter, followed by bay leaf, minced garlic and chopped onion. Cook till the raw smell is gone and onion has softened. Stir in corn kernels, herbs. Saute for 4-5 minutes on low heat. Pour in stock to the pan. Bring everything to a boil. Then let it simmer for 15-20 minutes. Lower the flame, add cream. Let it simmer for 5 more minutes. Stir in crispy bacon. And switch off the flame.